Your wedding is one of the most memorable days of your life, and at Promenade Limousine & Coachworks of Tampa Bay, we understand just how important this special day is. A red carpet sprinkled with rose petals? Her favorite champagne waiting inside the car? No problem! When it comes to your dream wedding, a day you only get to live once, no details are overlooked and no corners are cut. At Promenade Limousine & Coachworks, we go the extra mile to ensure your special day is unforgettable. We offer everything from luxury sedan rentals, perfectly intimate for two, to spacious stretch limousine rentals large enough accommodate your entire bridal party. Need to rent the whole fleet for large groups? Or how about a limo bus to take your group to the reception hall? If you can conceive it, we can make it happen! Call us today at (813) 223-1691 (Tampa) or (727) 898-6167 (St. Petersburg) to reserve your wedding limousine rental. You can also use our Free Online Reservation System. Promenade Limousine & Coachworks recognizes that a wedding is more than just a ceremony – it's an all-day, all-weekend extravaganza not just for the bride and groom but for everyone! 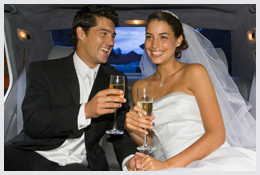 We offer flexible, affordable wedding limo rentals and weekend packages. Accommodate out-of-town guests with airport pickup, transportation to and from the rehearsal dinner, to and from the wedding venue, the reception hall, the hotel, and back to the airport.